NEW YORK – History will be made every night during the 2011 Stanley Cup Playoffs, just as it has throughout every postseason since the National Hockey League’s founding in 1917. And while thrilling this spring to the latest memorable moments being produced in pursuit of pro sports’ most storied trophy, hockey fans can vote to determine the top playoffs moment in NHL history. Beginning today and running through Game 4 of the 2011 Stanley Cup Final, NHL.com will present an interactive, multimedia “bracket” that pits pairs of 64 of the most famous happenings in NHL postseason history against one another in a single-elimination format designed to crown an ultimate winner. The two-month competition, which will be chronicled and analyzed on NHL Network as well as NHL.com, also will feature the views and filled-out brackets of hockey experts and celebrities who are passionate about the game. Fans visiting nhl.com/history can choose the balletic grace of Bobby Orr soaring through the air after scoring the Cup-clincher for Boston in 1970 or the remarkable toughness of Toronto’s Bobby Baun playing with a broken ankle in 1964. The fearless Mark Messier guaranteeing victory and seizing an epic series in 1994 or the selfless Joe Sakic handing the Cup to Ray Bourque to hoist first – and finally -- in 2001. Does Mud Bruneteau’s goal to end the longest game in NHL history in 1936 rate over Pat LaFontaine’s Easter Epic ender in 1987 or Petr Klima’s 1990 tally to end the longest game in Finals history? Do five Maurice Richard goals in one game trump the first playoff hat trick of Wayne Gretzky’s career? 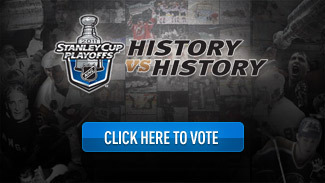 Visitors to nhl.com/history, NHL.com’s comprehensive special site devoted to the project, will be able to decide. While there, fans can peruse a treasure trove of videos, photos and personal recollections that bring each of the 64 moments to life. Voting in the first round will open one "region" at a time for one week at a time. When the field is whittled to 32 moments, the entire second-, third- and fourth-round clashes will be open to voters for a week at a time. The four semifinal moments, as chosen by NHL fans, will be revealed on the day of Game 1 of the 2011 Stanley Cup Final. The top moment in Stanley Cup Playoffs history, as voted by NHL fans, will be announced on the day of Game 4 of the 2011 Stanley Cup Final. Note: All times above are Pacific Time.